← What to do in Winnemucca? Lee Vining, CA- I-395- lots to do! It was about 2 months ago that I found a great article in Sunset Magazine about traveling scenic I-395 in California. This is how we decided to take this route and we are really glad we did. We arrived in Lee Vining, CA on Thursday afternoon and checked into the Mono Vista RV park. The campground is located just above Mono Lake and just a few miles from the Tioga Pass Road leading into Yosemite. This location situated us just perfectly for days of exploring. On Friday morning we got up early to make the long ride into Yosemite via route 120 (Tioga Pass road). The ride from Lee Vining up to the gate was extremely scenic with snow capped mountains everywhere. The snow line is around 9000-9500 feet and the pass goes above 10500 so we literally drove up into the snow. We can now say we didn’t miss snow this year. It is a long drive into Yosemite, over 2 hours each way. We knew that this would be our only day to spend here because of the travel time, so we made the most of it. 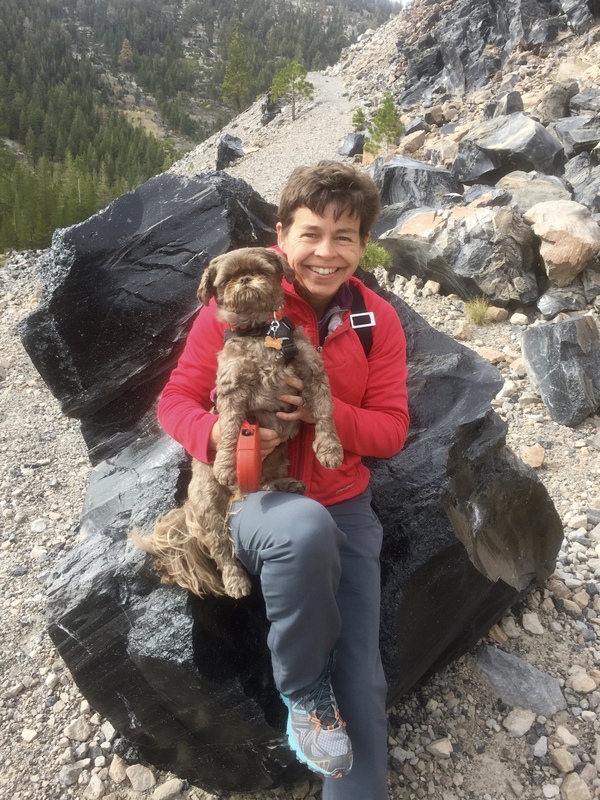 National Parks for the most part are not “dog friendly” for hiking. Yosemite allows them on the bike trails and the path to lower Yosemite Falls. 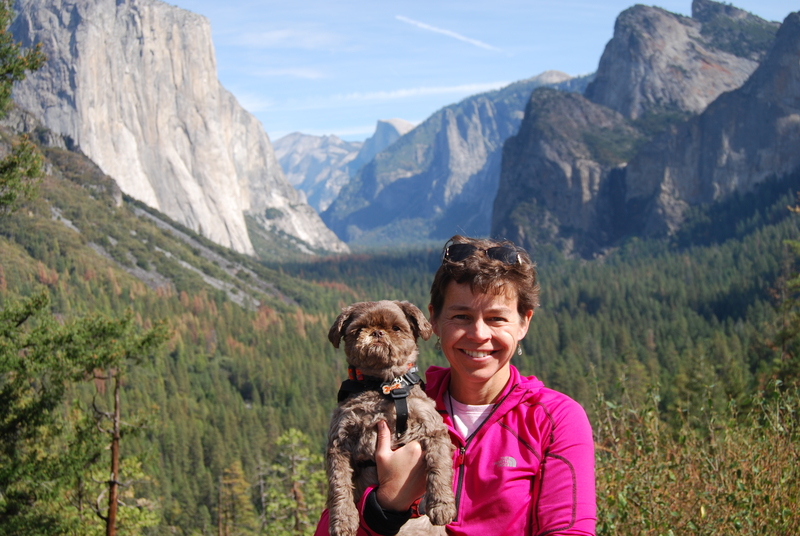 We arrived in Yosemite valley around 10:30 am and got in a 3.5 mile walk with Gizmo to the falls. The last time John and I had been in Yosemite was about 10 years ago in the spring. At that time the waterfalls were roaring and all of the flowers were blooming. Yosemite is always beautiful but my recommendation is to plan a spring trip if you want to see it in all it’s glory. The one thing you have to be aware of is that some of the major roads leading into or around Yosemite close for the winter and there is not guarantee when they reopen in the spring. We were fortunate that both the Tioga Pass road and Glacier Point road were open. We ended our day at Glacier Point. This is the best place to see how big and rugged Yosemite Valley is. It was a long day but definitely worth the ride to “re-imprint” in our brains the beauty of this national park. On Saturday morning we decided to explore Devil’s Postpile. The gate to this national monument is about 30 minutes from where we are staying. The entry fee is $10 per car unless you have a national park pass. Our pass is truly paying off with all of the parks we have been to so far. The road from the gate down to the park is very skinny and winding with a steep grade downhill. It took us about 30 minutes from the gate to get to the parking area. We didn’t see another car on our way in and John joked that we would have the place to ourselves. Boy, was he wrong. The parking lot was full, this is a very popular location. 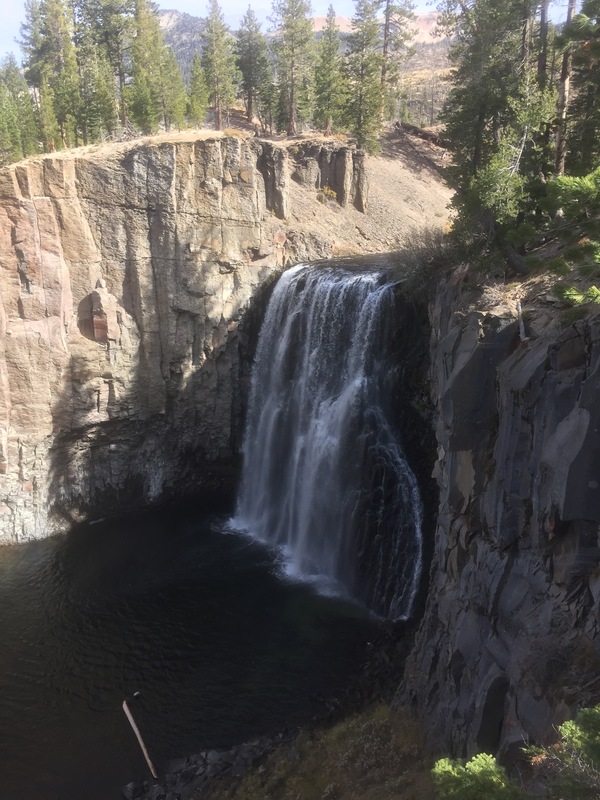 The plan for the day was a 5+mile hike to Rainbow Falls and to take in the postpile on the return hike. This is a great hike, just be prepared that a large portion of the hike is in the sun. There was a huge fire that came through here in 1992 and burned most of the trees down. New trees are growing but they are very small and offer no shade. The waterfall was huge and was flowing very nicely. The postpile is very similar to Devil’s Tower in Wyoming, only smaller. It is really amazing to see these naturally occurring columns. 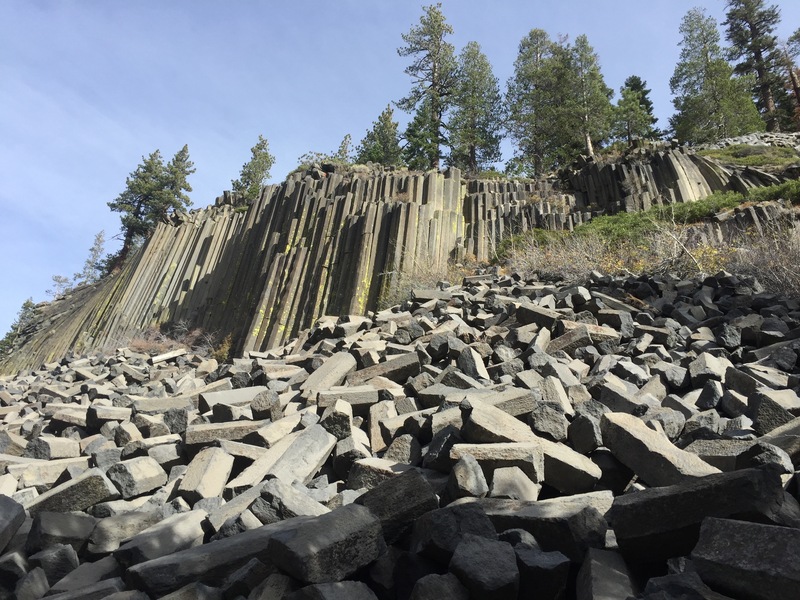 I was really glad we got the chance to hike to the top of the postpile and look down at the tops of the columns. Devil’s Postpile is located near Mammoth Lakes. This is a really nice ski resort area with a fairly decent sized town. I was pleased to get to a grocery store to restock our supplies. This is the kind of town you could spend a day in if you wanted to do some shopping and dining out. 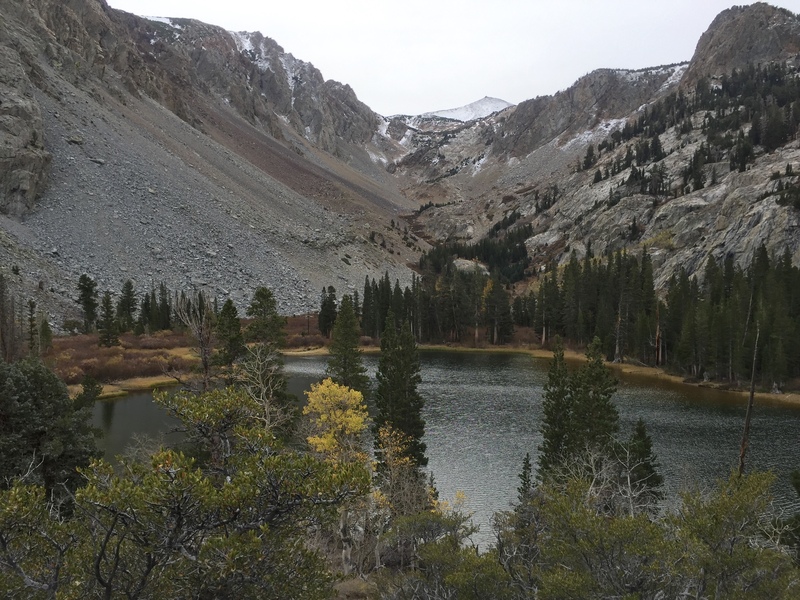 On Sunday we decided to do the June Lake scenic drive and take in another hike. The article from Sunset Magazine had recommended Fern Lake as a nice rugged hike. The trail is just 1.7 miles up to the lake but you climb 1500 feet in this short distance. The trail is mostly dirt with very few roots and rocks to negotiate. It took us just about an hour to reach the lake but we were moving slow because the start of the hike is at 7300 feet and goes up to 8800 feet, and we are still not quite used to the altitude when it comes to exercise. The lake is beautiful and is surrounded by snow capped mountains. We had decided to make Sunday a shorter day because we were getting tired from the non-stop sightseeing. Then we saw the road to Obsidian dome on our return trip to the campground. We both agreed another short side trip would be fun. The ride into obsidian dome is a short 2 mile dirt road detour from I-395. This is another really cool place and you can definitely tell there was a major volcanic explosion here. We drove the 2-miles into the parking area but there are several turnouts along the way if you don’t want to travel the full distance. We spent some time checking out the hunks of obsidian and then took the obvious path to the top of the dome. At the top of the dome there were sections of pumice in addition to obsidian. We got an early start to Monday. John jumped out of bed at 4am and said “what is that sound, is it a bear?” He looked out the RV window and there was a HUGE bear going through the trashcan outside our window. I’m sure glad we followed the rules and didn’t put trash out after 4pm. This is our last day in Lee Vining before we head south. This will be a slower day, our only plan is to explore the tufas on the south shore of Mono lake . Our first order of business was to make a call to Dometic as our “very fancy” vacuflush toilet with macerator has been taking longer to flush then it did earlier in our trip. I had read all of the manuals on the toilet and couldn’t find how long it should take to flush. John made the call this morning and found out that the macerator should run 30-90 seconds, so ours is within the time frame. We found out that any time you are above 5000 feet the air is thinner and the toilet will run longer. Our current campground is at over 7000 feet. They even sell a kit for the toilet if you plan on staying at altitude for a long period of time. Who knew altitude would cause issues with a toilet? This entry was posted in Lessons Learned the Hard Way, Sightseeing, The journey west and tagged Devils Postpile, Dometic, Fern Lake, June Lake, lee vining, Mammoth Lakes, Mono Lake, Mono Vista RV Park, Obsidian Dome, Rainbow Falls, sunset magazine, vacuflush, Yosemite. Bookmark the permalink.